Where did the hair go? Oh, oops…I meant…where did the time go? After 20 years with a ponytail except for a brief stint when my son was born in 2003, fitness finally pushed me into getting rid of my long hair permanently. I skipped way too many workouts just so I wouldn’t have to wash my hair for a second time in the same day. With it looking less healthy and thinning significantly, I decided it was time to take the razor to it. In February, my kids chopped off the ponytail, and I buzzed it down to a #2. Now I just have to convince myself to haul out the clippers once every couple of weeks or embrace looking like I stuck my finger in a light socket. Anyway, I’m a bit late to the party, but it’s time for a New Year’s post. Let’s look at all things Sloth for 2014. 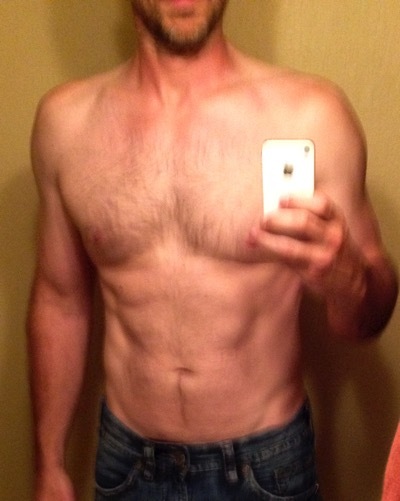 At the beginning of the year, I wasn’t in great shape. I was lifting sporadically and running even less. Once higher temperatures arrived, though, I started training more consistently hitting peak fitness with marathon training in September and October. During the year, I managed to decrease my body fat by about 1.5%, but I also lost a significant amount of muscle between a trip to Florida and a wrist injury. The picture below is where I’ve been during and since marathon training. I don’t usually post progress photos, but I’m going to try to be a bit less apprehensive about my appearance going forward. Since I’m planning to run a triathlon, there won’t be anywhere to run and hide anyway. My goal for 2015 is not to let my fitness fall apart during the first couple of months of the year like I have in years past. So far, so good for January. I’ve been running since 2011 when I made the rather impulsive decision to run the Oklahoma City Memorial Marathon with fellow Sloth Kevin. In 2012, I only attempted one race, and then again in 2013, I tried to race more but still only made it to 3 races. Were it not for a late injury, I would have been in 6 races this year. Instead, I laced up my running shoes 4 times, 3 of which happened to my trail shoes. 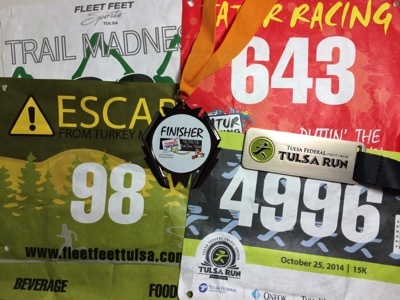 My first race of the year was Trail Madness, a new trail run from Fleet Feet Tulsa on Turkey Mountain. I had been running trails off and on through the Winter, and when I saw the race was in the middle of the day (my favorite time to run), I had to sign up. Being the idiot that I am, I signed up for the 16k extremely undertrained. Even though I was a bit out of shape, I learned a lot on my first trail race. I learned that if you’re focused on making the turn, a broken limb on the outside of a curve can find your eye (le ouch). I also learned that even though I’m not the fastest trail runner, I am not too shabby running uphill. Other runners would pull away from me downhill and in the flats, but if we were headed uphill, I was usually gaining ground. The last thing I learned is that I should seriously think about hanging around for awards. I took 2nd place (9:43 pace) in my age group and have nothing to show for it because I left. 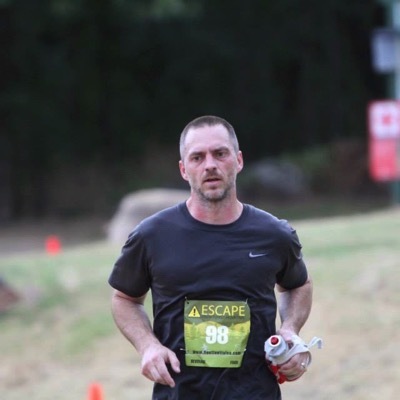 After training through the Summer, I next raced Escape from Turkey Mountain, another Fleet Feet Tulsa trail race at Turkey Mountain. Are you sensing a theme yet? I ran the 5 mile distance and ended 5th in my age group at 8:42 pace. I’m finding it difficult to increase my pace much beyond 9:00 min. miles on trails as I’m applying the brakes way too much downhill and burning out my quads as I go. Even though I’m running shorter distances in the mid to low 7’s on the road, I’m stuck around 9 minute pace on the trails. I’m hopeful I’ll be able to figure out downhill trail running a little better during 2015 so I can move into the low 8’s for my average pace. For my first and only road race of the year, I entered the Tulsa Run. 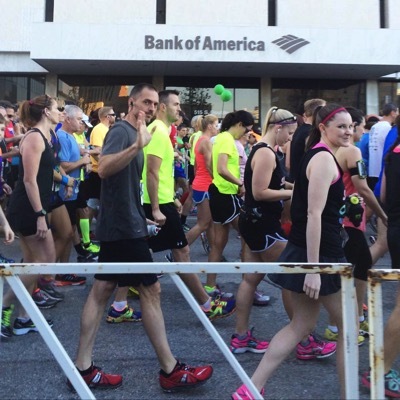 The Tulsa Run is one of Tulsa’s biggest and oldest races. At 15k, it’s an in between distance that is scheduled perfectly as a tune-up for the Route 66 Marathon or any other late-Fall marathon. Two factors conspired to make this a great race for me. First and most importantly, it was unseasonably warm. I think it was in the 60’s at 8am for the race start and warmed up from there. Second, the route changed from previous years. Instead of the long, flat route down Riverside, construction forced the race to pick an alternate route, and they chose a portion of the Route 66 Marathon course. It was a hilly route, but the downhills weren’t too steep for me to run hard, and I’m fine with uphill. My goal for the race was to stay under 8:00 pace and hopefully get in under 70 minutes. I just barely met both goals by running 7:48 pace. I ran my final race of the year one week later, the Turkey and Taturs Trail Race. I ran pretty well for about 12 miles, and then the wheels came off. Never having run 25k on trails before, I made poor pacing decisions. I attacked all of the early uphill sections and burned out all of my lower leg muscles in the process. I finished 25k at 10:23 pace. Turkey and Taturs is where I think I knocked myself out of the 2014 Route 66 Marathon. Within a week, my achilles was injured, and it appears I may have kicked myself or been hit by something on my calf during Turkey and Taturs. Oddly enough, I didn’t realize anything was wrong until 4 days after the race. After some rest and rehab, I tried to get back to it and ended up injured again. I decided not to run Tulsa Runner’s Jenks Half Marathon, one of my favorite races of 2013, in favor of more rest and rehab to get ready for Route 66. Finally, the weekend before Route 66, I thought I was feeling better and did a test run. Before I finished the first 10k, I could feel my leg wasn’t right and knew I wouldn’t be able to run the race. Instead of packing it in, I decided to go ahead and run long. At 15 miles, my leg was pretty bad, but I had run an out and back route so I had no choice but to keep going or face the shame of calling my wife for a pickup. I finished 20 miles on a bum leg in 2:54 for 8:43 pace. I realize it would have been close, but I think I could have run another 10k under 10:00 minute pace to get my 4 hour marathon. For 2015, I hope to break 4 hours at the Oklahoma City Memorial Marathon, and then look at significantly lower times in the Fall. In August, I decided to move toward competing in triathlons by getting all of the necessary equipment for training including a bike. After visiting a couple of bike shops, I found a Kestrel Talon at Legends Bicycles. I had never ridden a bike with clipless pedals (seriously cyclists, horrible misnomer), and I was well prepared by everything I was told and read that I would fall over a stoplight a few times before making the adjustment. In my first ride, I managed to survive an hour of riding without an incident. On my 2nd ride, though, I screwed up, and it had little to do with the pedals, but they made it much worse. During a noon ride, I was headed into the last 3 miles when I stumbled into the Jenks Middle School track team. I came up behind 3 kids walking the shared path shortly before a downhill turn under a bridge. I went wide around them and must have lost my focus. I put my front tire in the gap between the pavement and the grass causing the wheel to lock up and flip the bike. I didn’t have any serious injuries, but my entire right side, including my bad ankle, was injured. The worst of it was a jammed wrist which eventually knocked me out of upper body strength training for several weeks. I stayed with cycling for several weeks but also had to give it up to let my wrist heal. The great thing about what little cycling I was able to do was that it translated directly into a faster run cadence. The higher cadence translated directly into more speed. Now that 2015 is here, I’m getting back into the saddle and heading outside. Most of my late 2014 rides were on the trainer which makes the treadmill feel positively exhilarating. Seriously, how do cyclists do trainer rides and spin classes? It feels like torture to me, but then again, I bet they despise the treadmill so to each their own. My other goal in 2015 is to get out on the actual roads and not just the trails. I need more time in the saddle, and it’s tough to do with all of the construction on the trails in Tulsa. Most triathlons are also on roads so I need to time to practice avoiding road hazards which are less prevalent on the trails. Well, I pretty much punted swimming in 2014. After a couple of training sessions in August upon deciding to add swimming to my training regimen, I felt some problems in my shoulders and backed off. I’m also having trouble finding the time to get to the pool. To cure both problems in 2015, I’m going to start swimming when my kids are already practicing with their swim team. Jenks has a masters swim program at the same pool, at the same time so it will fit well with my schedule. Hopefully I’ll be ready once TAT starts doing their open water swims in the Spring. 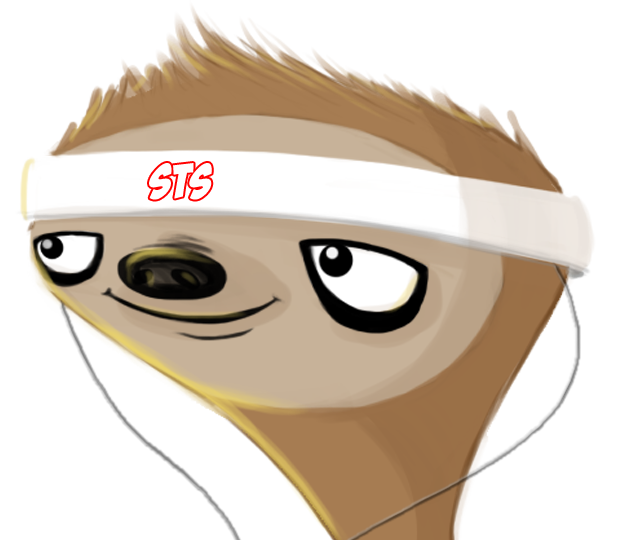 I haven’t talked too much about it on the blog to date, but I am still developing mobile fitness tracking software starting with SubdueTheSloth GPS. 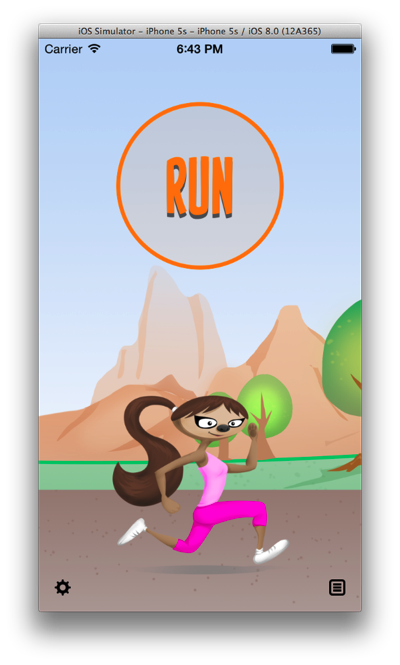 I realize STS GPS has been under development for a long time, and both mobile hardware and fitness software are evolving rapidly. Nevertheless, no other hardware or software has stepped in and filled some of the gaps in functionality that caused us to found SubdueTheSloth originally. So, we’re still moving forward and should be needing beta testers sometime before Summer. 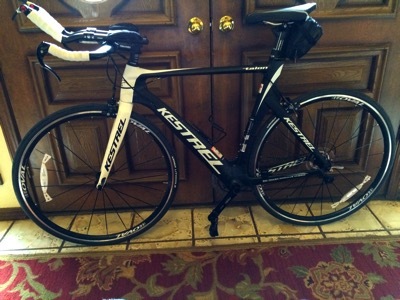 This entry was posted in About and tagged apps, cycling, running, swimming, trail running, triathlon by Jason. Bookmark the permalink.